Nintendo boast about their highly successful product launch across Europe. It's going to be a good Christmas period for Nintendo, possibly their best for over a decade. Wii has sold extremely strongly in all regions with many more people still trying to get their hands on a console. Even the PR writers have lost it and start using Wii-puns. 'Tis the season to be jolly. "Wii made its highly anticipated debut across Europe on Friday 8th December, with thousands of people desperate to get their hands on Nintendo’s new console. As the must-have product for the festive season Wii was an instant hit. Attracting vast crowds and selling out in stores all over Europe in just a matter of hours, a breathtaking 325,000 units were sold in the first two days making it the fastest selling home console in history." Nintendo must realise they have a huge hit on their hands, even here at the NintendoLife.com office we've been fielding phone calls from desperate parents trying to find a Wii for Christmas. "Demand for Wii has been so great that shops all over Europe had large queues forming outside for up to three days before the launch and hundreds of shops opened their doors at midnight on launch day to allow gamers to get their hands on Wii. After just one weekend on sale, shops across Europe sold out of Wii consoles and daily shipments are now arriving across Europe to replenish stock. 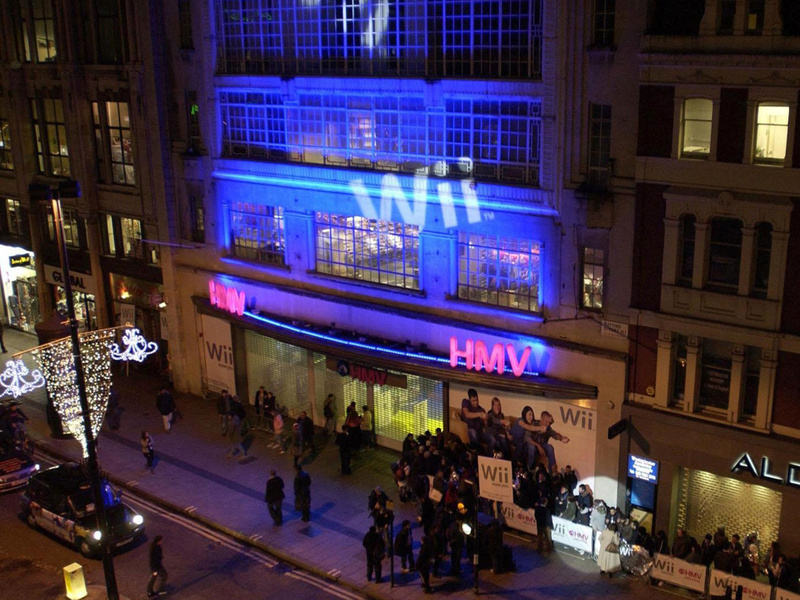 “The demand for Wii has been truly amazing, and the official launch at our Oxford Street store was one of the biggest events we've ever staged there. HMV has received a huge amount of customer pre-orders - beyond anything we've ever seen before, including from family shoppers as well as dedicated Nintendo gamers. This suggests that while Wii is obviously one of the must-have items this Christmas, it also has the potential to appeal to a huge mainstream audience over the longer-term." From all the reports we've been hearing, Nintendo would basically sell as many consoles as they wanted running up to this years Christmas season, hopefully all the Nintendo elves are making them as fast as possible! "Wii mania in Europe follows the phenomenal success of Nintendo’s console in the Americas and Japan, where over a million units have been sold in just three weeks. In the Americas, where the console launched on the 19th of November, 600,000 consoles were sold in the first 8 days from launch. The Japanese launch saw similar success with around 400,000 units being shipped to stores for launch day and selling out during the first morning on sale. After just a few days of sales in Europe the Wii seems to be achieving similar success." Roll on 2007, Nintendo's year? We'll see. Incredible. Just goes to show that you can lose the console war for two generations running and still come out fighting. I'm amazed how well the general public have taken to the new machine, let's face it the Gamecube was beaten into first place fairly soundly by M$ and $ony - any other company would probably have given up by this point, but it just goes to show how well Nintendo manage their dealings and how well they know the market. I'll be honest - I never expected the Wii to be THIS popular.